See how Franklin is "Soaking It Up!" 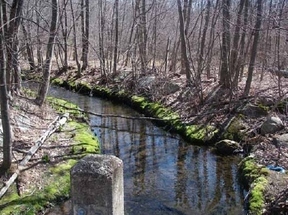 Like many towns in Massachusetts, traditional development and infrastructure in Franklin has disrupted the natural water cycle creating water resource challenges. Franklin's town water supply, sourced from local wells, is stressed in summer months. Water levels in local rivers and streams often drop to levels that threaten wildlife and recreation. Rainfall, which used to be naturally absorbed where it fell, by plants or soil, is now entering the River as stormwater runoff from paved surfaces, causing water pollution, flooding and erosion. Stormwater carries high levels of phosphorus to the river harming the ecosystem and wildlife in the Charles River. Franklin is committed to the long term stewardship of its rivers and water sources and actively seeks sustainable approaches to managing its natural resources. The Town of Franklin and Charles River Watershed Association have been working together for many years to develop projects to improve the health of the Charles River and its tributaries and protect Franklin's water supplies. •Creating plans for priority sub-watersheds in Franklin to demonstrate approaches for meeting the Upper/Middle Charles River Nutrient TMDL. •Designing and building green infrastructure retrofits on town property to manage stormwater on site. •Developing a brand new Rain Garden program for Franklin that will provide training to and encourage Franklin residents to build rain gardens on their own property.